This year’s recipients of the annual Queen’s Graduates’ Association (QGA) scholarships, highlight the outstanding research being undertaken in the field of medicine, health and life sciences. Top Faculty of Medicine, Health and Life Sciences PhD students Erin Magee (from Bangor) and Nathan Clarke (from Belfast), each received a scholarship of £2,500 to support their exciting and potentially far-reaching research projects at the QGA’s annual President’s Drinks Reception (on 2 May) at First Trust Bank’s University Road branch. A first year PhD student at the School of Pharmacy, Erin is conducting research to tackle the growing financial burden that chronic wounds present to healthcare providers. The increase of chronic wounds in the UK is estimated at 12% per annum, coupled with an annual cost of £5.3bn, a figure which is expected to almost double in 5 years’ time. Erin’s project aims to develop both a smart wound dressing and a smart ink which can be printed onto plastic surfaces to sense biofilm presence in a hospital setting; thus providing a 24/7, non-invasive monitoring system that could minimise unnecessary dressing changes and delays in treatment, resulting in improved patient outcome and an overall lower cost of care. Nathan is a first year PhD student in the School of Biological Sciences whose project focuses on combatting the profound impact of the liver fluke parasite on the health of plants, animals and humans across the globe. The parasite conservatively accrues annual losses of $3 billion US dollars to the agri-food industry through loss of livestock production, with particular emphasis on the cattle industry, which experiences losses of £300 million in the UK alone each year. The disease caused by this parasite is also now considered an emerging neglected tropical disease in man with up to 17 million people infected and close to 100 million at risk. His project aims to further understand the potential mechanisms of drug resistance in the liver fluke parasite, with the ultimate goal of identifying novel drug targets for exploitation in the future. 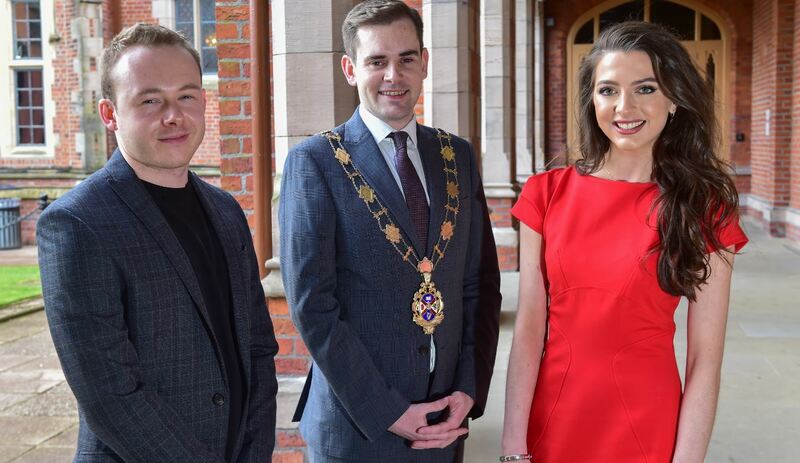 QGA President Fergal McFerran said: “It’s a great pleasure to award both Erin and Nathan with our annual scholarships on behalf of the Queen’s Graduates’ Association. Speaking at the reception, Erin Magee stated: “First and foremost, I would like to express my gratitude to the Queen’s Graduates’ Association for the generous provision of this scholarship. Receiving this award is one of the most significant events in my academic career to date, and one that I will treasure indefinitely. “The experience that comes with travelling to different institutions to learn new skills, or presenting results at international conferences is invaluable. This scholarship will financially support me in this, enabling me to get the full benefit of my time as a PhD student. Nathan Clarke said: “Being nominated for a QGA scholarship was an honour for me, but to have received it was a privilege and a great start to my PhD. Not only has it afforded me to live comfortably during my first year of postgraduate research, but it has enabled me to travel abroad to attend courses that have allowed me to develop skills that would otherwise not have been possible. “As a result of the scholarship I have also been able to dedicate time to traveling throughout the country as a voluntary STEM ambassador, promoting science, technology, engineering, and mathematics development and careers to school children. “I hope to continue making the most of the opportunities presented to me throughout my PhD and I’m forever grateful for the work that the QGA continue to do in supporting graduates in their work,” he finished. The annual QGA Scholarship programme rotates around the three University faculties, with each school within the rostered faculty asked to put forward their best student for the award. The winners are chosen by an independent panel. For more on the activities of the QGA visit the Association website or contact Queen’s Alumni Relations Officer, Natasha Sharma or phone +44 (0)28 9097 3135. Pictured (L-R) are: Nathan Clarke (2018 scholarship awardee), Fergal McFerran (President, Queen’s Graduates’ Association) and Erin Magee (2018 recipient).